China has begun its busy year of space launches with a flawless liftoff of the Belintersat-1 telecommunications satellite from the LC3 launch pad at the Xichang Satellite Launch Center, located in Sichuan Province. The mission commenced at 11:57 EST (16:57 GMT) on Friday, Jan. 15, when a Long March 3B rocket ignited its four boosters and started a short vertical ascent. Burning its core stage’s engines, the rocket began to pitch over and roll, heading southeast, shortly after liftoff. The shutdown of the boosters occurred about two minutes and 20 seconds into the flight and they were jettisoned about one minute later. Then, the vehicle continued its mission powered by the core stage alone, equipped in one four-chamber engine, until its separation about two minutes and 40 seconds after the launch. The second stage moved the mission forward, burning its engines for approximately three minutes until the rocket’s third stage took over control of the flight. Burning liquid hydrogen and oxygen, the vehicle’s third stage, fitted with one YF-75 engine, headed towards the deployment of its payload. The Belintersat-1 satellite separated from the launch vehicle about 26 minutes after liftoff. It will be delivered into a geostationary orbit (GEO) at 51.5 degrees East on Jan. 25. The spacecraft will be operated by the Belarusian government’s company Belintersat for up to 15 years. It is expected provide a wide range of telecommunication services, including satellite TV and radio broadcasting and broadband internet access. 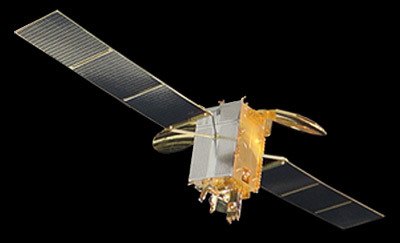 Belintersat-1 was built by the China Aerospace Science and Technology Corporation (CASC). The car-sized satellite has dimensions of 7.9 by 6.9 by 11.8 feet (2.4 by 2.1 by 3.6 meters) and weighs about 5.2 metric tons. It is based on CASC’s DFH-4 bus consisting of a propulsion module, service modules, and solar arrays spanning 72 feet (22 meters) when fully deployed in space. The DFH-4 platform can be used in high capacity broadcast communications satellite, new generation direct broadcasting satellite, new generation tracking and data relay satellite, and regional mobile communications satellite. It is a large telecommunications satellite platform of a new generation, keeping high capability in output power and communication capacity ranking with international advanced satellite platforms. The DFH-4 bus can be outfitted with C, Ku, Ka, and L transponders. The satellite is equipped in 20 C-band and 18 Ku-band transponders delivered by Thales Alenia Space. 34 of them are 36 MHz and 4 are 54 MHz-bandwidth to provide a full set of telecommunication services. The spacecraft has an output power of 10.15 W.
Belintersat-1 was built to provide a full range of advanced satellite services in Europe, Africa, and Asia, as well as ensure global coverage in the Eastern Hemisphere. The spacecraft is part of Belarusian National System of Satellite Communication and Broadcast – the largest project in the field of telecommunications, implemented by this country. The program was designed to provide telecommunication services for governmental and commercial clients both in Belarus and overseas. Belintersat disclosed that it plans next satellite launch in the future; however, the company hasn’t made a final decision yet. “Generally, we consider the second satellite in the future. Service regions, ITU [International Telecommunication Union] filings, a manufacturer, funding – all these important issues should be considered before the final decision,” Dmitry Kuzmin of Belintersat told Astrowatch.net. The three-stage Long March 3B rocket that was used in Friday’s flight is currently the most powerful Chinese launch vehicle in service. The 180-foot (55-meter) tall booster is capable of launching up to 12 metric tons of payload to low-Earth orbit (LEO) or 5 metric tons of cargo to a geostationary transfer orbit (GTO). The 3B/E version that was employed for the mission is an enhanced variant of the rocket, featuring an enlarged first stage and boosters, improved computer systems and a larger payload fairing. The rocket’s first two stages, as well as the four strap-on boosters, use hypergolic fuel (unsymmetrical dimethylhydrazine with nitrogen tetroxide as the oxidizer) while the third stage burns cryogenic fuel (liquid hydrogen with liquid oxygen as the oxidizer). This configuration of the launch vehicle was brought into service in 2007 to increase the rocket’s GTO cargo capacity, to allow it to be capable of lifting heavier GEO communications satellites. The first Chinese mission of the year was the 223th flight of the Long March rocket series and the 35th flight overall for the 3B version. With the Belintersat-1 launch, China starts a very busy year in terms of sending payloads to orbit. In 2016, the country intends to carry out more than 20 space missions. 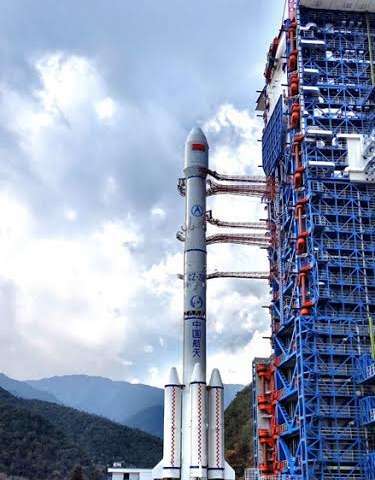 China also plans to return to the business of human space flight this year and conduct maiden launches of the next-generation Long March 5 and Long March 7 rockets. Shenzhou-11, a planned crewed mission, is slated to lift off from the Jiuquan Satellite Launch Center and dock with China’s second planned space station, Tiangong-2, which should be on orbit by the time the crew’s Shenzhou spacecraft is sent aloft. The exact launch dates for these missions have yet to be released.